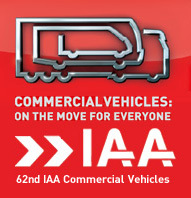 Following Concentric's acquisition by Haldex in the spring, IAA 2008 is the first public appearance of Haldex Concentric in its new form, with a new management structure focussing on an expanded range of energy-saving and environmentally-friendly technologies for the next generation of diesel engines. In overall command of the new technology drive is Ian Dugan, Haldex Executive Vice President and Head of Haldex Hydraulic Systems Division, who in only five years led Concentric to a position of market leadership as a supplier of oil, water and fuel pumps for diesel engines worldwide: " We have completely restructured the new organisation to harness the best resources of Haldex and Concentric, ensuring that we have the strongest possible team in all the key functions- engineering, production, management and sales. We have outstanding technologies already fully developed for the next generation of engines and more than capable of delivering the improvements in performance, efficiency and emissions required by Euro 6 and the regulations beyond EPA10." "The Haldex Concentric team has an outstanding track record not only for innovation but also for establishing new technologies in the market and helping OEMs to achieve real performance and environmental benefits. Within the Haldex family we benefit from bigger and better resources as well as the full backing and commitment of the Haldex board." In addition to the pioneering Concentric variable flow oil and water pumps, which together can deliver fuel savings in excess of 4%, the new business unit will also be putting its weight behind Haldex's Varivent EGR technology and the Alfdex oil mist separator. Varivent works by stimulating gas flow from the exhaust manifold to the higher pressure of the inlet in turbo-charged diesels, making the EGR rate independent of charge pressure. A variable venturi optimises EGR whilst minimising the restrictive effects on air or gas flow characteristic of alternative methods. Extensive engine testing has confirmed fuel savings of 4% for on-highway heavy truck applications. This technology is particularly suited to interstage turbo-charging and high EGR flow installations and can be configured to suit individual engine turbo-charging and EGR strategies. The latest generation Afldex, seen for the first time at IAA, offers diesel engine manufacturers vastly increased efficiency and throughput in removing oil and soot from the crankcase gases. It is an extremely robust, "fit and forget" design based on a centrifugal separator and requires no maintenance or servicing throughout the engine's life. Haldex Concentric is part of the Haldex Hydraulics Division. The division is a major supplier to the world's truck, agricultural and construction equipment industries, with manufacturing facilities in Germany, Sweden, the USA, China and India as well as at the divisional headquarters in Birmingham, UK.